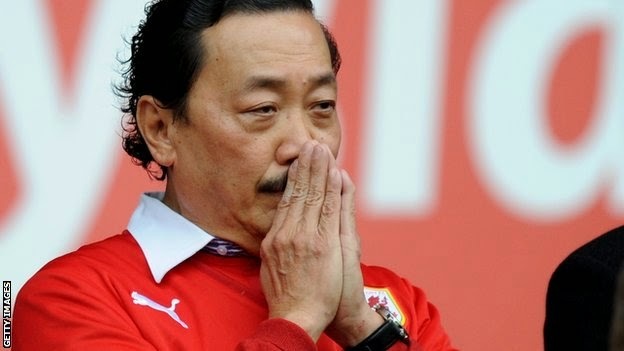 Cardiff City owner Vincent Tan has accused Wigan counterpart Dave Whelan of being "a racist". The Malaysian businessman criticised Whelan for using derogatory comments about Jews and the word "chink" in an interview with a national newspaper. Whelan has denied being racist, but Tan said: "I think he insulted the dignity of all Jewish people. I think he insulted the dignity of Chinese." Tan also hit out at former Cardiff manager Malky Mackay. The Scot was appointed as Wigan boss this week but is still under investigation by the Football Association followingallegations he made racist, sexist and homophobic comments in text messages and emails sent while he was in charge of Cardiff. Mackay has apologised and denied being racist, but Tan, who sacked the 42-year-old last year amid acrimonious circumstances, leading to a legal dispute, thinks the decision to make him Wigan manager is a mistake.